The Machinist is one of the three new jobs in FFXIV Heavensward along with Dark Knight and Astrologian, which are respectively tanking and healing jobs. Machinist is a straight damage-dealing DPS job, which mean it is a ranged DPS job that can provide ample support to the party. This guide is to tell you how to play Machinist in FFXIV Heavensward. To unlock Machinist, firstly you should get access to the Heavensward content, which requires you to have completed all the main story quests in FFXIV. Then head over to NPC Stephanivien. Speak to him and accept the quest - ‘Savior of Skysteel’ to start the Machinist job quest that doesn’t need much effort to complete. As a ranged DPS with support abilities, Machinist has a lot in common with Bard. Machinist relies a lot on using an ability that may proc another ability, then use that proc ability or returning to the beginning of the rotation. Split Shot has a 50% chance to increase the potency of your next Slug Shot by 80. If you get the pro when you use Slug Shot, Split Shot is your go-to weapon skill and if that, procs you use Clean Shot. Go back to Split Shot again, if you don;t get a proc. The use of ammunition is one of the abilities that differs Machinist from Bard. In order to get the most of out of many of the Machinist’s attacks. Reload puts 5 rounds of special ammunition in the Machinist’s weapon, which lasts 30 seconds and has a 60 seconds recast. You can get one round of special ammunition and restore 50 TP with a 30 seconds recast with quick Reload. You should ensure you have ammunition loaded, which means before the battle begins, you should use Reload and Quick Reload as they are ready to go again before you need them. Gauss Barrel ability is another ability for Machinist. When this is active, your damage is increased by 20%, however, you no longer auto attack. Besides, all weapon skills have a cast time when Gauss Barrel is active, which means you can’t move when shooting under the effects of Gauss Barrel. When this ability is active, some other skills like procs have special buffs. The ability to use turrets is the biggest aspects of the Machinist job separating from Bard and ther DPS class. When Turrets are deployed during a battle, they account for roughly 15% of the Machinist’ damage. How, in addition to inflicting damage, the Turrets provide support ability, which is similar to a Bard’s songs. The main abilities of Machinist are Rook Autoturret and Bishop Autoturret. Rook Autotorret for party members and Bishop replenishes MP. When you are using the Rook or Bishop turrets, it will not auto-attack and you will lose out on that additional damage. All in all, the Machinist has similar abilities with a Bard. If you are looking for a DPS job offering a bit of support, Machinist should be a good choice. 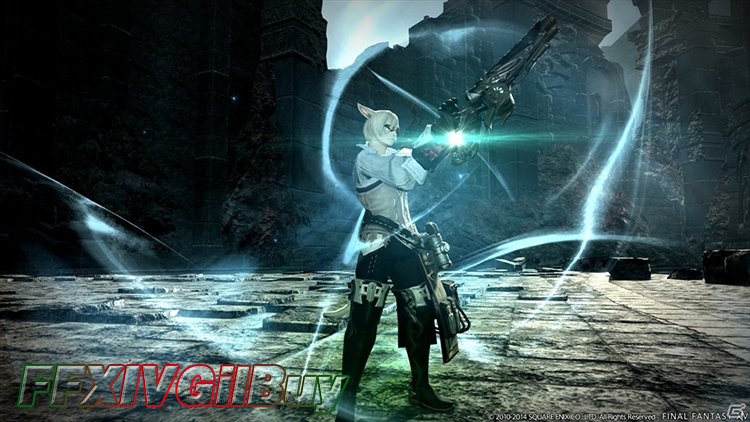 Hope this guide can be helpful for you to be a good Machinist in FFXIV Heavensward. If you want to buy cheap FFXIV Gil, FFXIVGilBuy provides huge amounts of FFXIV Gil with safe and fast delivery!